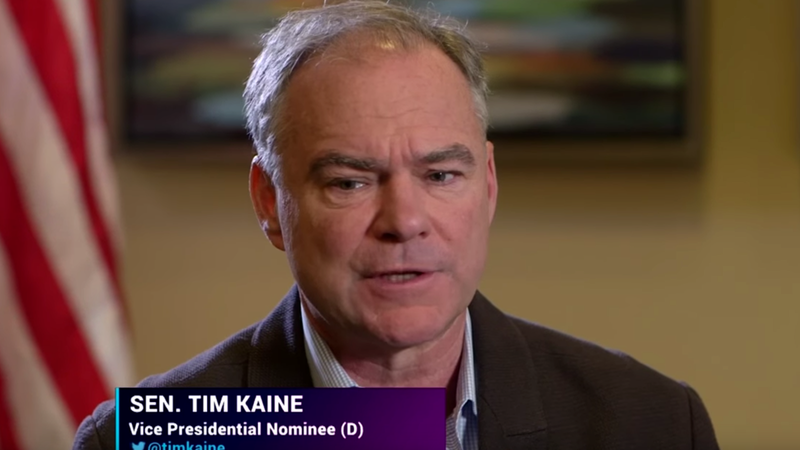 During an exclusive interview with Fusion’s Alicia Menendez on Saturday, Vice Presidential candidate Tim Kaine voiced hesitant support for President Obama’s view that there might be a way for the Dakota Access Pipeline—which has been the subject of mass protests from Native Americans who claim their water supply would be endangered and who have been met with a militarized police response—to be re-routed, though he stopped short of calling for the project to be canceled, as Senator Bernie Sanders has done. The Clinton campaign has been criticized for its relative silence on the issue. “So you’d be in support of re-routing it?” Menendez asked. “Well, look, they’ve already re-routed it once,” Kaine said, referring to a scrapped route that would have run just north of Bismarck, North Dakota’s capital. It was canceled because of concerns it could taint the city’s water supply. Last month, the Department of Justice and the Army Corps. of Engineers issued a statement saying work on a publicly-owned part of the pipeline near Lake Oahe would be halted until they could re-evaluate whether the work damages Native American cultural sites. They urged the company behind the Dakota Access Pipeline, Energy Transfer Partners, to do the same on privately-owned sections of the pipeline. The company has not halted work and expects the pipeline to be completed and operational by the end of the year.